JAKE : How I got bitten by a man-eating shark! When I go swimming at QE 2 Park with friends I like to just wear Speedos (I once tried swimming in boxers and board shorts and I almost drowned.) 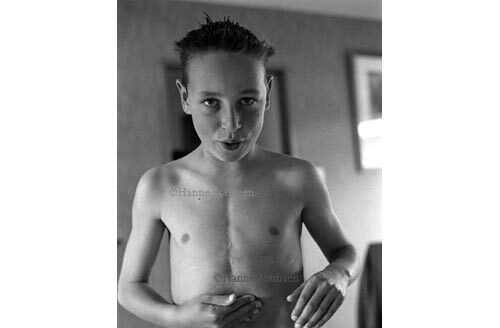 People see the big scar on my chest where I had all the operations and they come up to me and say, "What's that?" I tell them, "I got bitten by a shark," and they reply, "No you didn't." Then I'll get my friends and they say, "Excuse me, but he actually did, so if you don’t believe us…why do you care anyway?" So, then people say things like, "Wow! How big was it?" And I'll say, "Oh, about that big," and I'll put my arms really wide apart, "but once it bit me I was knocked out, so it's really hard to say." And then they ask me, "What's the bump there for?" and sometimes I'll say, "It was a stone that got embedded in my chest," or I'll say, "Oh, that helps me with my heart because the shark actually bit into a piece of my heart, so it helps it beat easier" (which is practically true - actually it's my pacemaker and if my heart misses a beat, it does beat for it). Sometimes if a kid sees my pacemaker they ask my friends, "What's wrong with him?" My friends and I make up random stories about it. Like, instead of talking about a shark attack we'll look all shocked and surprised and say "Mate! Haven't you got one? Man you should have one at your age!" And my friend, who's about 12 says "Yeah mate! Haven't you had one put in yet? I've got one." So when they say "What's wrong with Jake?" my friends say "What's wrong with you? You haven't got one? Oh mate, if you haven't got one you can get a really bad disease!" Or we make up other stories, like my friend will say, "Oh I had a cricket bat and I smashed a ball into him!" Or "We squashed a can and smashed it in there and they just stitched it up and left it there!" We have a lot of fun with that.